ww2dbaseOrzel (Eagle) along with her sister sub, Wilk (Wolf), were delivered to the Polish Navy in 1939. Originally designed to be used against Soviet shipping, the Orzel went into action against the Kriegsmarine in September 1939. As the Germans restricted ship traffic in the war zone, Orzel and the other Polish had poor hunting. She evaded German destroyers and aircraft, but mechanical problems and the illness of her captain forced the submarine to seek refuge in the neutral harbor of Tallinn, Estonia, on 15 September. ww2dbaseUnder pressure from Germany, the Estonians illegally interned the sub. The crew was placed under armed guard. It was stripped of its main weapons, navigational equipment, and charts. At 3 a.m. on 17 September, Orzel's second in command Lieutenant Commander Jan Gruzinski led the crew in an escape. They overpowered the guards, disabled harbor searchlights, freed the sub from its moorings and slipped out of the harbor. ww2dbaseIn one of the most daring adventures of the war, Orzel escaped to England. The sub hid on the seabed by day to avoid German and Soviet patrols. Without any charts or equipment Gruzinski navigated using the stars and dead reckoning. Orzel stopped briefly at the Swedish isle of Gotland to release the captive Estonian guards and then slipped through the Danish straits, avoiding German ships and aircraft. ww2dbaseBy early 1940, Orzel was on active patrol with British submarines in the North Sea. On the morning of 8 April 1940, she was cruising south of the Norwegian coast at periscope depth when Gruzinski spotted the German merchant ship Rio de Janeiro. Orzel surfaced and ordered the ship to heave to, but the merchant vessel sped up in response. Orzel fired two torpedoes, one of which hit the Rio de Janeiro, breaking her back. In minutes, the deck of the "innocent" merchant ship was swarming with German soldiers heading for the lifeboats. By sheer chance, the Polish sub had sunk one of the first waves of the German invasion of Norway. Unfortunately, the Norwegian authorities failed to react to the scene of wet, bedraggled German soldiers stumbling ashore in their country until a full scale invasion was underway. ww2dbaseIn June 1940, Orzel went on patrol once again and never returned. It is believed she ran into a mine. She was lost with all hands. ww2dbaseSources: HistoryNet, Poland’s Navy, 1918–1945, the Polish Campaign of 1939. 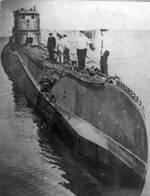 2 Feb 1939 Polish submarine Orzel was commissioned into service with the Polish Navy. 3 Apr 1940 Submarine Orzel departed Rosyth, Scotland, United Kingdom to patrol the coast off Kristiansand, Norway. 8 Apr 1940 Polish submarine Orzel, under British command, sank the German transport ship Rio de Janeiro in the Skagerrak at 1150 hours. German sailors rescued by Norwegian ships admitted that they were en route to attack Bergen. Wow. Not a bad history. A sistership of Orzel was Sep ( Vulture, in english). Wilk (Wolf) and her siterships named Rys (Lynx) and Zbik (Wildcat) were an older submarine class. That is right. A sister of Orzel (Eagle) was Sep (Vulture) which was interned. The relations between Poland and Estonia were very friendly - sharing even intelligence. Orzel was welcomed warmly, its crew was offered a friendly meal, sauna and beds to sleep in. The submarine should have been interned properly - it would have been the right and legal action for a neutral country, which Estonia was. Unfortunately, it wasnt interned - Estonians trusted the Polish, and the Polish used it. Captain of Orzel asked the Estonian in command to turn the ship around, so that the nose would be fronted to the sea, he explained that the dock would damage the ship otherwise. It was done. The same night Orzel escaped. This was used by the Soviet Union, Estonia was blamed in hiding hostile submarines - a soviet transport ship was sunk for provocation and Molotov proposed the Soviet–Estonian Mutual Assistance Treaty, which culminated in the annexation of the Republic of Estonia. The sister submarine Sep survived the war and was used to make a movie in 1958 about the Orzel escape. It was available on YouTube for a while (with subtitles) but it has since been made private. https://www.youtube.com/watch?v=EPc0ntWWId8 I managed to download a copy before it was blocked. It is a good account with a slight amount of exaggeration which can be excused. The Sep has since been scrapped but the movie does allow us to see exactly what the Orzel looked like inside and out. It is worth looking out for. The sister submarine was Sęp (Vultures). Wilk (wolf), Ryś (Lynx) and Żbik (wildcat) is another type. Does anyone have a copy of the Polish movie 'Orzel Escape'? or any other movies that may have been made?